In large part, the success of modern day Barcelona started with Johan Cruyff. As a stand out player and manager for the club, he revolutionized the way the game was played. His ideas, which seemed radical at the time such as the desire to keep possession of the ball are now commonly accepted practices in the sport today. While Cruyff laid the foundation, another player and coach whose impact has been felt at Barcelona is Pep Guardiola. In fact, Guardiola played a pivotal role for Cruyff’s teams as a midfielder. Cruyff loved attacking football and would often times play with only three defenders in the back in order to overwhelm the opposition in midfield. With this in mind, Guardiola played a valuable role in executing Cruyff’s tactics and became a product of the Cruyff school of thought. Later as a coach, Guardiola employed and improved upon many of Cruyff’s ideas. All things considered, the two have always had much admiration for one another and are both regarded as some of the most innovative minds the game has seen. As an example, Cruyff was one of the first proponents of ‘total football‘ where players could interchange positions fluidly throughout a game. In this style of play, attackers can play as defenders and defenders can play as attackers so long as the team’s overall structure stays in tact. Allowing players to switch positions encourages movement and can be confusing for opposing teams to defend. In a similar vein, one tactical innovation Guardiola brought to the game was the utilization of Lionel Messi as a ‘false nine‘. At it’s core, the false nine tactic stems from Cruyff’s total football philosophy by allowing the striker to move freely around the pitch. Giving Messi free reign to move would pull defenders out of position, open up space, and was extremely difficult to defend. Off the pitch, Pep Guardiola had an absolute belief in Barcelona’s academy system. At every level Barcelona teams employed tactics focused on dominating possession. For this reason the club developed skill players who were quick on the ball and fit extremely well into Guardiola’s system. In fact, in Barcelona’s 2009 champions league final victory, seven of the starters were La Masia products. 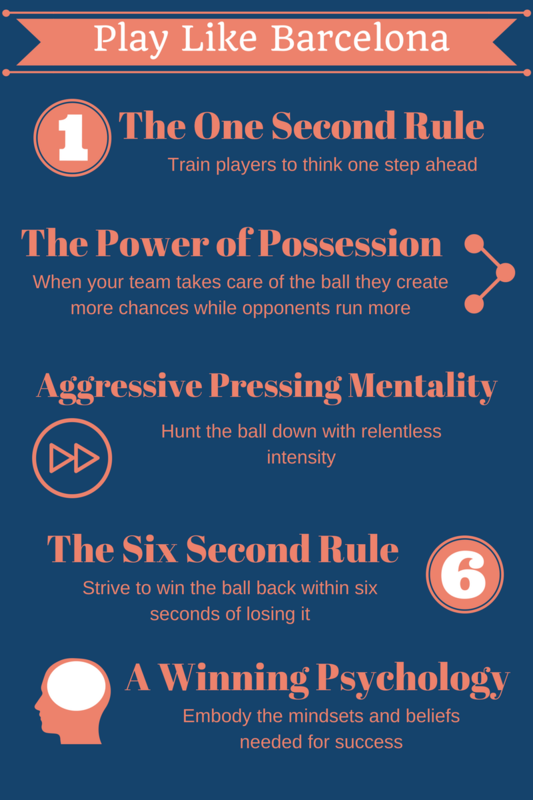 Below are five quintessential rules of the Cruyff and Guardiola schools of thought which have helped Barcelona produce an astounding level of soccer talent. In terms of decision making on the pitch, success or failure is often times decided in a split second. If a player has to take extra time to stop and think, available opportunities can be lost in an instant and the offensive play will break down. For this reason, Barcelona often times experience difficulty when signing stars from outside of the club because they lack the speed of thought and chemistry that the homegrown players possess. For instance, world class players such as Thierry Henry and Zlatan Ibrahimovic struggled to learn the Barcelona system and ultimately played their best soccer elsewhere. Keeping the ball has been a key tactic of the Catalans ever since the Cruyff era. While many teams don’t worry about possession, Barcelona crave it for several reasons. First, when Barcelona have the ball, the other team can’t score. Second, when Barcelona dominates possession, the opposing team wears out more quickly because having to chase the ball all game long is exhausting. Every player on Barcelona’s team feels a responsibility to keep the ball out of harms way, including the goal keeper. This is in contrast to many clubs who encourage their keepers to knock the ball long rather than attempting to pass out of the back. In addition, at most clubs when players win the ball, it is regarded as an opportunity to play forward quickly. At Barcelona when players win the ball, emphasis is placed on keeping it. Safe passes are deemed acceptable in order to retain the ball. With this in mind, often times Barcelona are knocked for their ‘tiki-taka‘ style or keeping possession for possession’s sake. Guardiola insists that his teams pass with a clear intention and that is to make it to the opposition’s goal. Here are a few drills on competitor spot that help teams work on moving the ball with the intent of scoring. Just as you would expect from a team that worships keeping possession of the ball, Barcelona start pressing the moment they lose it. Because it often times takes a few moments for players to orient themselves once they win the ball, this is when they are most vulnerable. With this in mind, Barcelona believe the perfect time to try to win the ball back is right after it’s lost. Alex Ferguson once noted that the amount of pressure his team faced in the Champions League final against Barcelona was ‘breathtaking’. They hunt the ball with a relentless intensity, especially after a turnover. Other cues for when Barcelona press include when their opposition takes a poor touch or turns towards their own goal. When players are facing their own goal they can no longer play forward which provides a great opportunity for Barcelona to close the space behind them. In my experience, using Barcelona’s possession style of play in conjunction with their aggressive defensive pressing tactics has yielded positive results at the youth level. These two ideas work together in harmony because emphasis is always placed on having the ball whether or not the team has it at any given moment. I tend to believe that trying to possess the ball is great for technical development and pressing once it’s lost requires physicality and optimal levels of fitness. While Barcelona love pressing aggressively, there are limits to how long any team can sustain it’s press. As a rule of thumb, Barcelona follow the six second rule. This means that players relentlessly hunt the ball for the first six seconds after a turnover. If after six seconds they are unable to win the ball back, they drop off and form a compact defensive structure. The key to success with the six second rule is that multiple players collapse on the ball the moment it is lost. Swarming the ball with two or three players helps to close off passing lanes and take away the attacker’s options. If the attacker escapes the initial pressure, the defense decides it’s best to drop back and get organized. Once a compact shape has been established, the defense can revert to traditional cues for when to press. An easy drill inspired by the six second rule is swarm the ball carrier. In this drill players practice applying pressure to an attacker while taking away their passing options. On a final note, one thing that separates the top clubs in the world from the rest is a winning psychology. While soccer analysts are quick to point to tactics and individual players as reasons for success, often times it’s the culture and mindset of a club that makes all the difference. Even when the odds are stacked against them, Barcelona never stop believing as evident by their astound 6-1 comeback win in the champions league against PSG. Reviewed and completely accurate. I used a few of these drills and concepts with excellent results over the past ten years. Many of the players I have trained are either with an Academy, Premier, Elite teams, or National team. Some have been scouted by Mexico Academy teams and Mexico National team! Thanks for the positive feedback, they are some of my favorite drills as well! Great article! As a soccer coach myself I’ve tried and tried to get my teams to play like Barcelona with varying degrees of success. I think the most important thing that you pick out in this article is about the mentality. To apply these techniques successfully the whole team needs to adopt the same philosophy and play together as a single unit, which is easier said than done! I regularly use rondos in some of our warm up activities and am going to try a couple of the drills you mention in section 2 as well.